I had a day out in London, visiting a few markets around Spitalfields. When I headed back to the station the sun came out for a few moments from the clouds and the street was nearly abandoned. 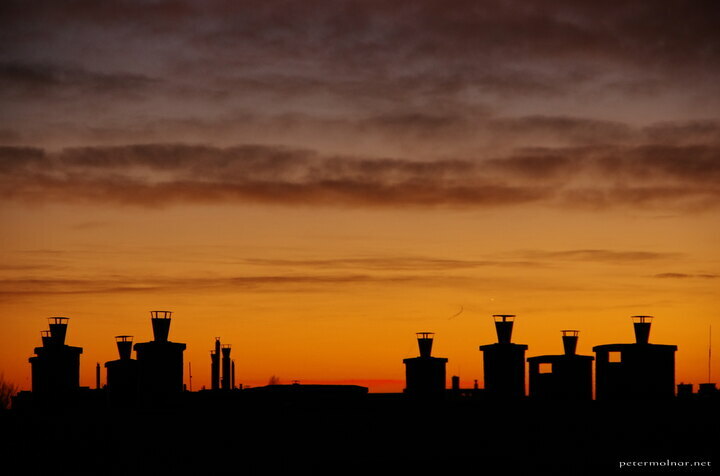 Just a bunch of chimneys on top of the concrete block houses in Hungary with a nice sunset in the back. To be honest, it’s a rare scene. This was photographed from my parents window and during the decade I lived here, I’ve barely seen anything similar. 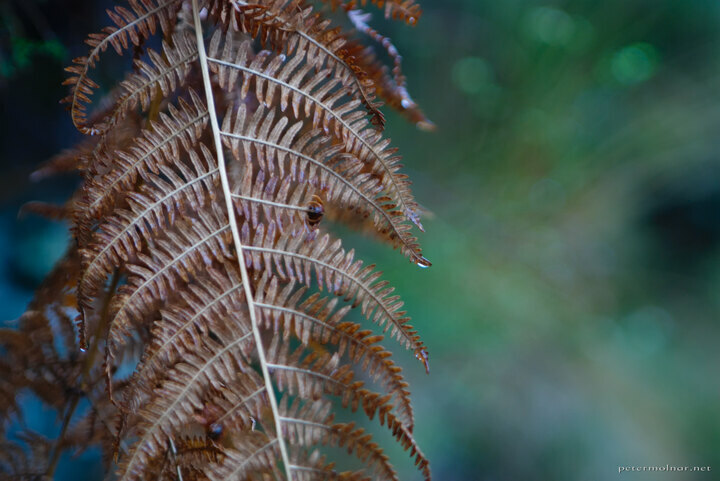 We visited the very middle of the Peak District in the middle of November, hoping that there are still a few, bright autumn colour trees around - we were wrong. 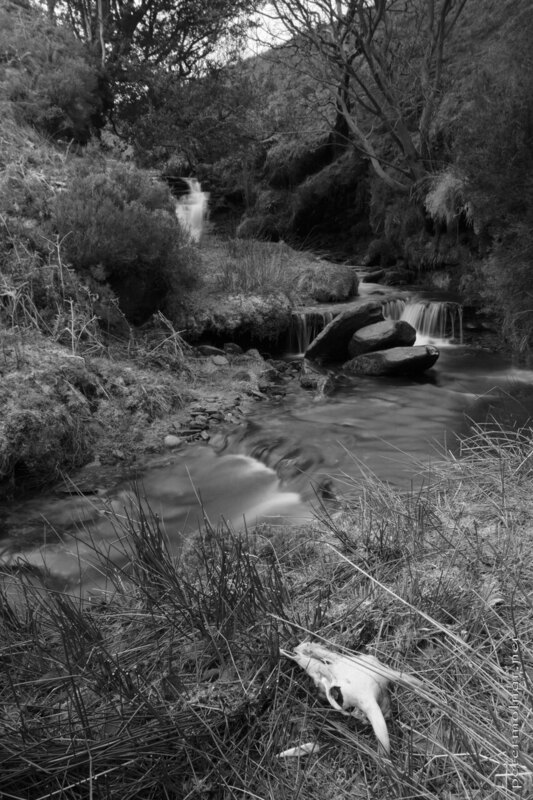 By this time of the years the Peak District is already in the winter state, so instead of photographing autumn trees we ended up photographing what we could. 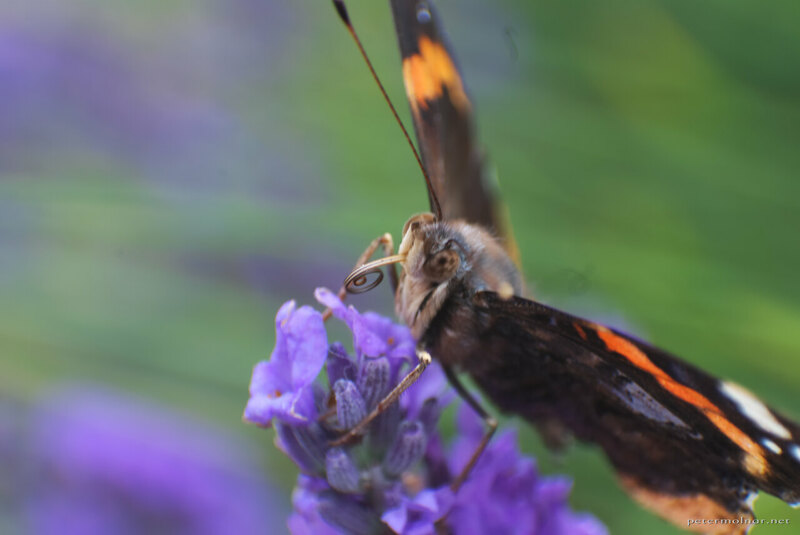 I was using my Jupiter 9 85mm f/2 old, manual, Russian lens. 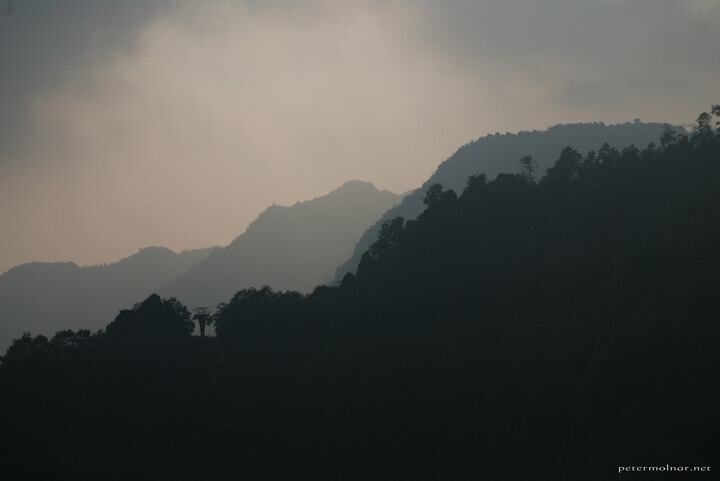 Sometimes the rude weather we got in Huanglong (黄龙) lightened up a bit and showed us the pines on the mountainside. 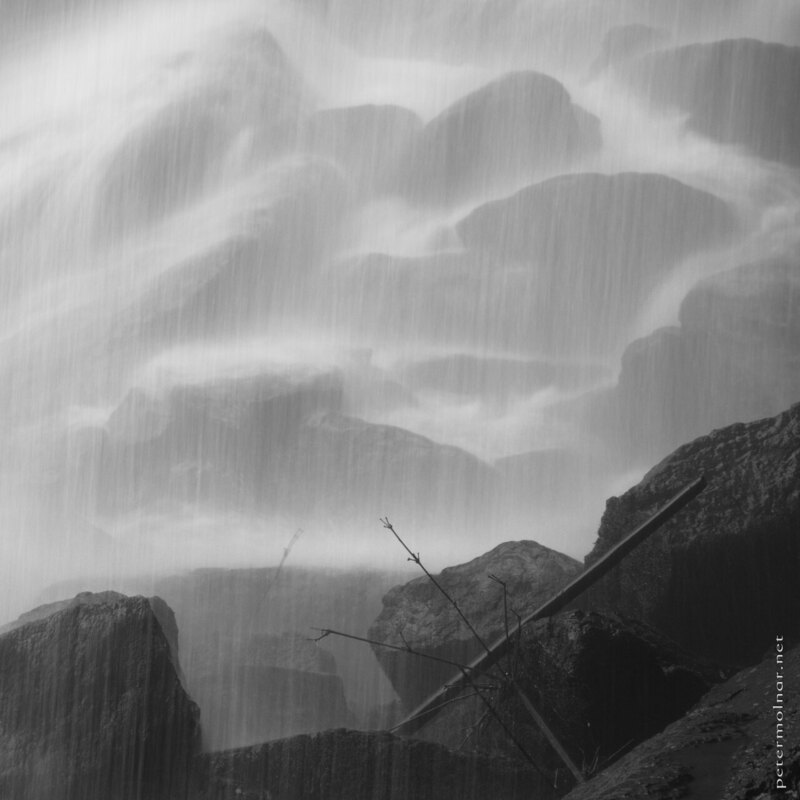 There is one waterfall in the Shunan Bamboo Sea (蜀南竹海国家公园) where it’s possible to walk behind it; it’s definitely a different view and feeling compared to the front views. 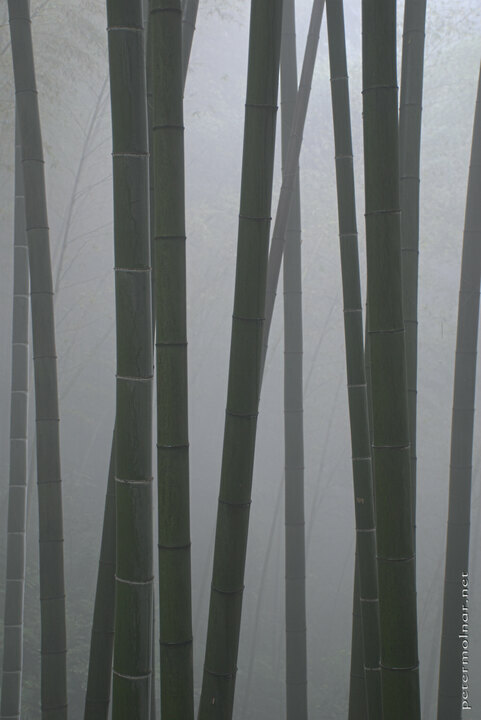 During our day in the Shunan Bamboo Sea (蜀南竹海国家公园) we had a thick fog. From one point of view it was bad that we could not see many of the marvellous waterfalls but on the other hand the mist gave a unique, mistique and remote feeling to the place. For someone not speaking Chinese at all getting to Shunan Zhuhai, the Bamboo Sea is not as easy as it seems, but due to the kind and helpful locals, our visit turned out fantastic. 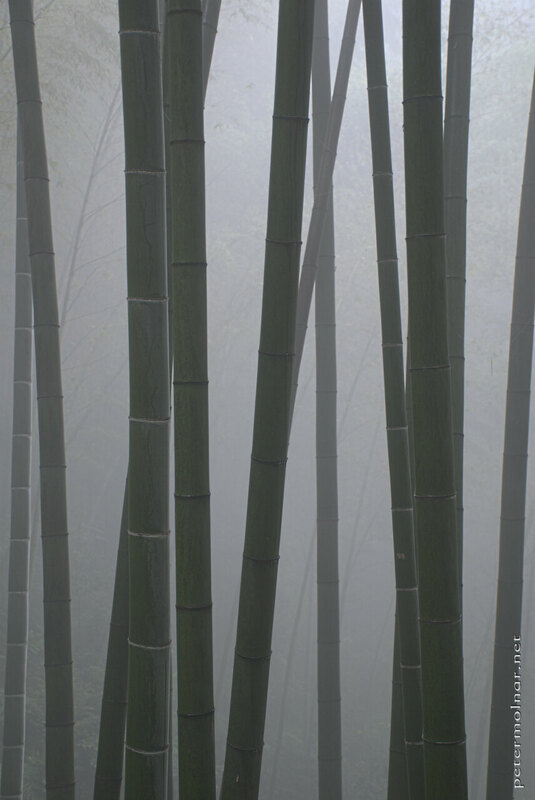 The Shunan Bamboo Sea (蜀南竹海国家公园) is a large, true bamboo forest: trees are extremely rare here. Numerous movies were shot here, it’s filled with ancient, interesting places to see and is definitely different from a normal, usual forest. 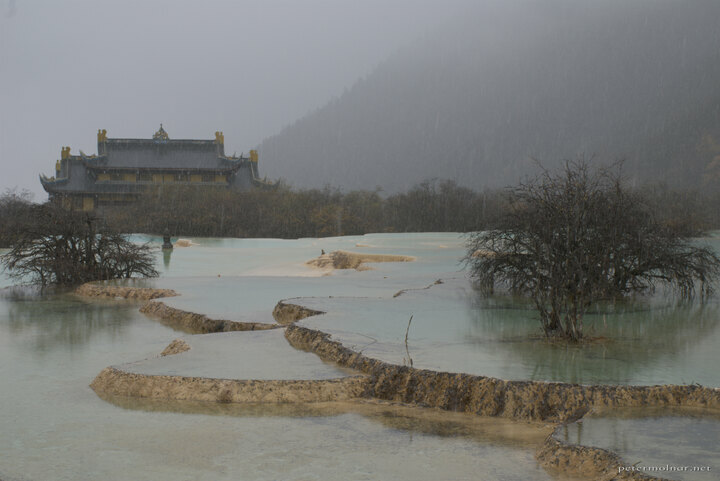 The day we visited Huanglong Valley at first we got snowing. Since we started at ~3800m it’s not that surprising that later it turned into sleet and rain. This is how Huanglong Ancient Temple ( 黃龍古寺 ) looks on the inside when it’s raining. 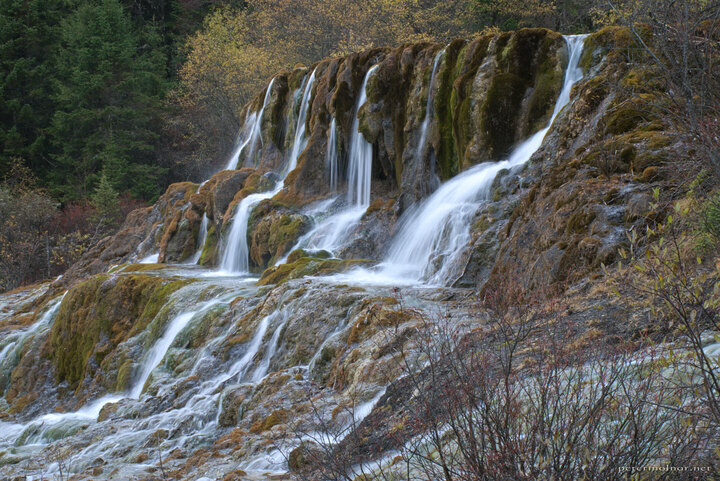 Huanglong Valley (黄龙沟) is a scenic area in Sichuan with countless, bright blue and green ponds and astonishing waterfalls. 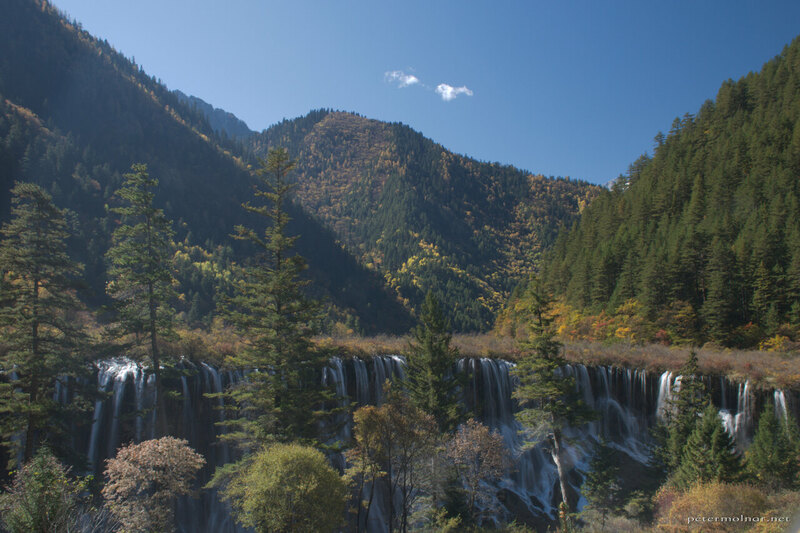 This is theMarvellous Flying Waterfall (飛瀑流輝) in autumn. 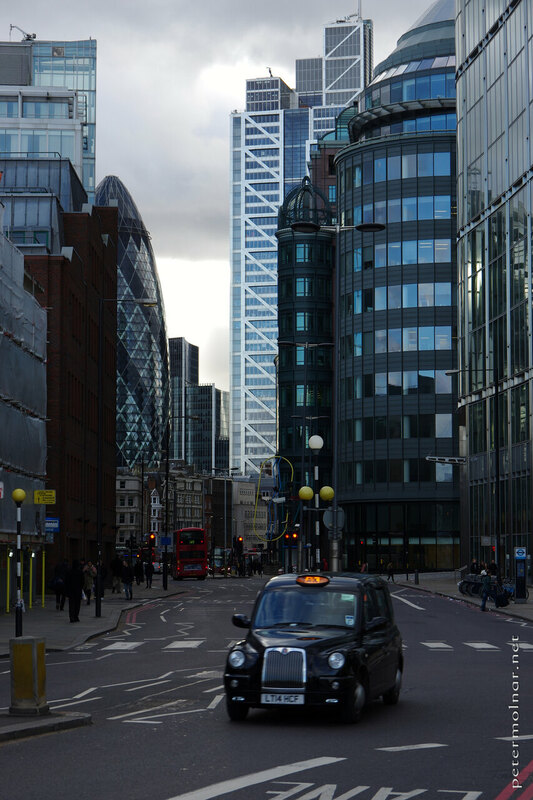 It’s usually photographed from the other side, but I’ve found this composition better. We had a rough weather during our visit; fortunately no sleet or rain was pouring at the moment we arrived here. 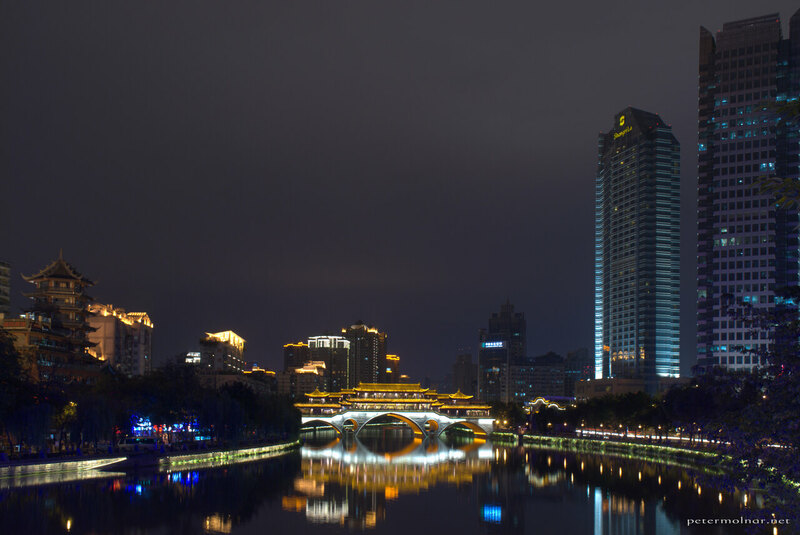 We saw the beautiful Anshun Bridge (安顺桥) from the distance from the bus when we got back to Chendgu (成都) late in the night. Next day we decided to visit it; during the time we were prepairing to take the pictures a photographer lady told us that it’s much nicer from the other direction. We followed her through the Halloween-themed party places on the riverside and I have to admit: it is better from the other direction. 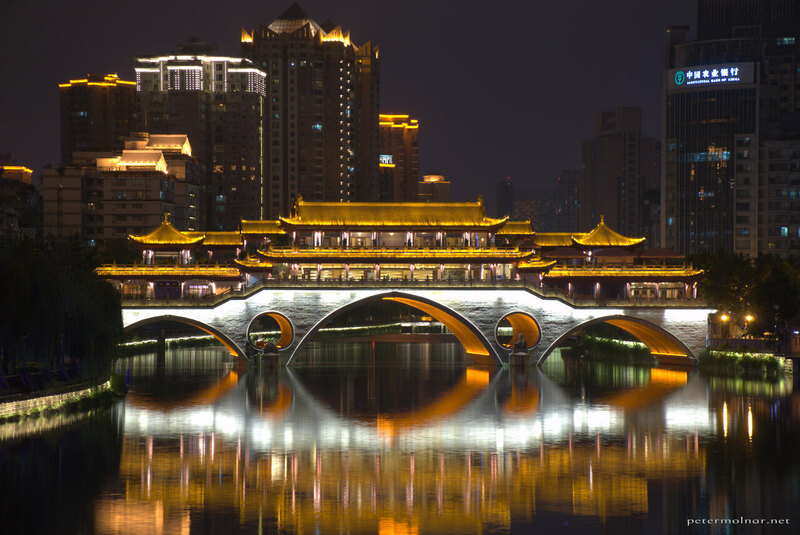 A closer view of Anshun Bridge (安顺桥) in Chendgu (成都). Many thanks for the photographer lady who told us that it’s much nicer from the other direction. We followed her through the Halloween-themed party places on the riverside and I have to admit: it is better from the other direction. Jade green pond in Huanglong (黄龙). 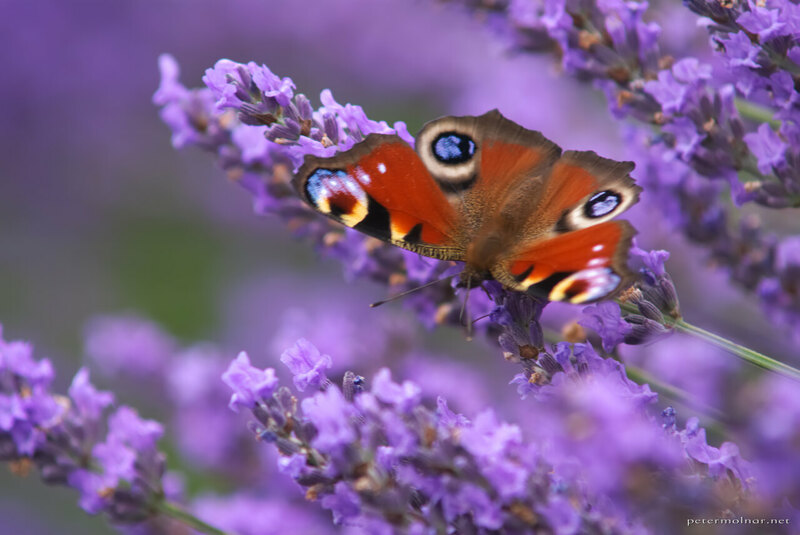 I never really believe these colours exist without any alteration to the pictures, but they are real. 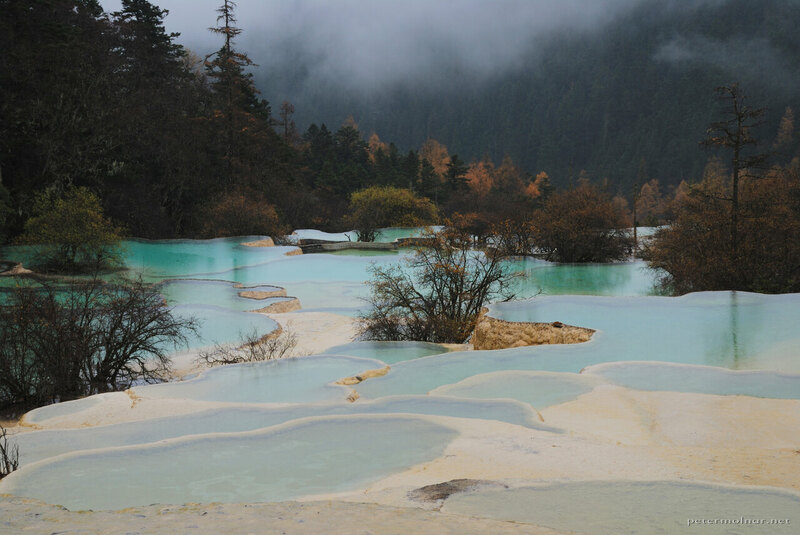 Huanglong is one of a kind with it’s fairytale ponds. A view somewhere near the Bonsai Pond in Huanglong (黄龙), with a not-too-bonsai size, autumn colour fir and the unbelievably blue pond it’s growing out from. 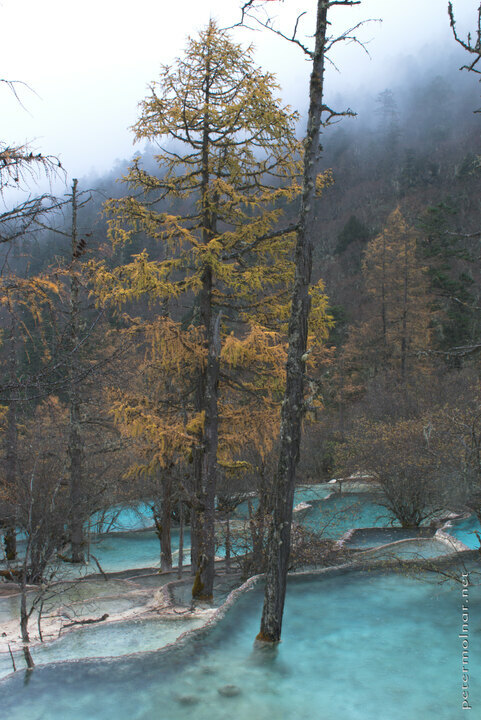 Ponds in Huanglong; these blue ponds are said to be the scales of the giant Yellow Dragon that valley is named after. 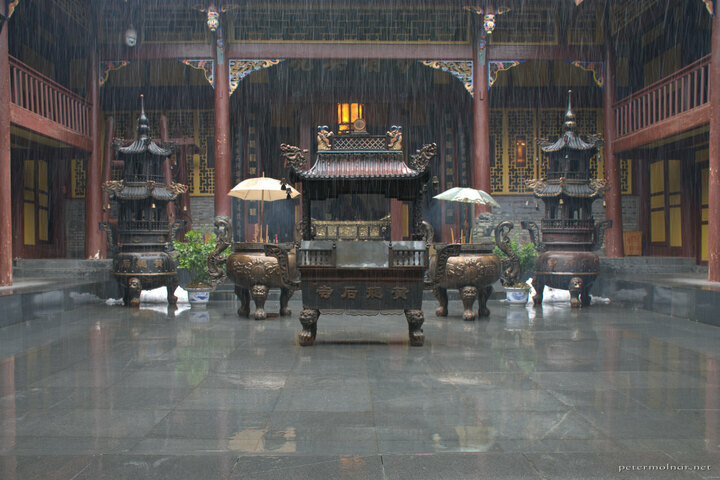 The hundreds of years old Huanglong Ancient Temple from the shore of the Multi-Coloured Ponds in a bit of a snow. 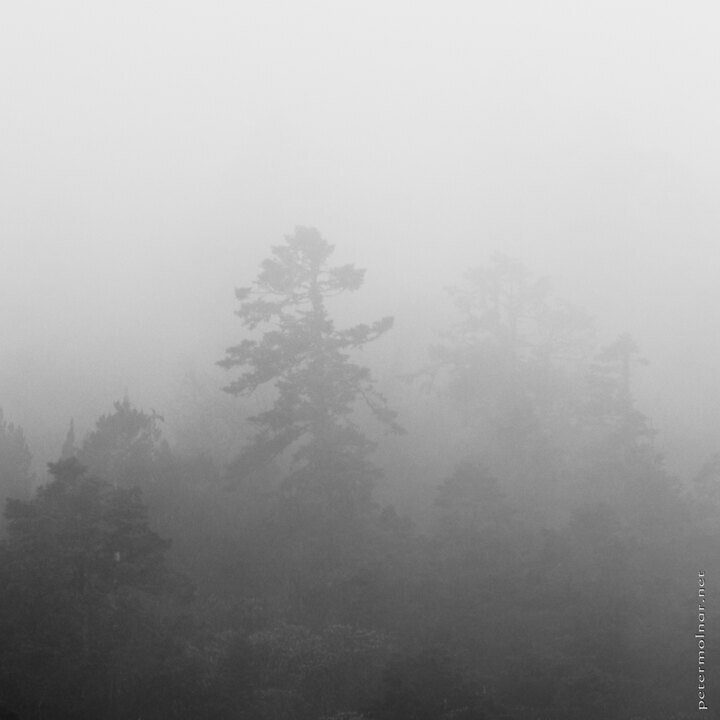 Even though this is not the weather you wish for at a visit to a natural phenomenon it certainly has it’s own magic when you see these places in a misty, gloomy weather. 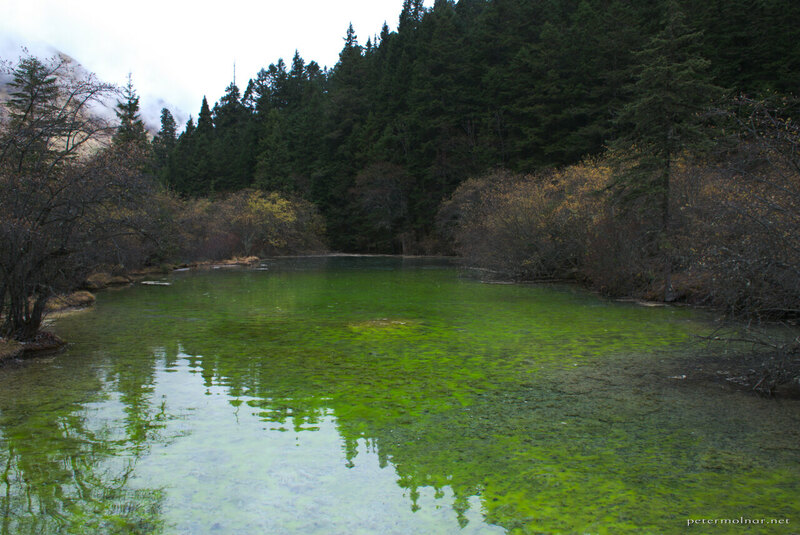 Peacock Riverbed is a part of the Five Flowers Lake of Jiuzhaigou Valley (九寨沟). 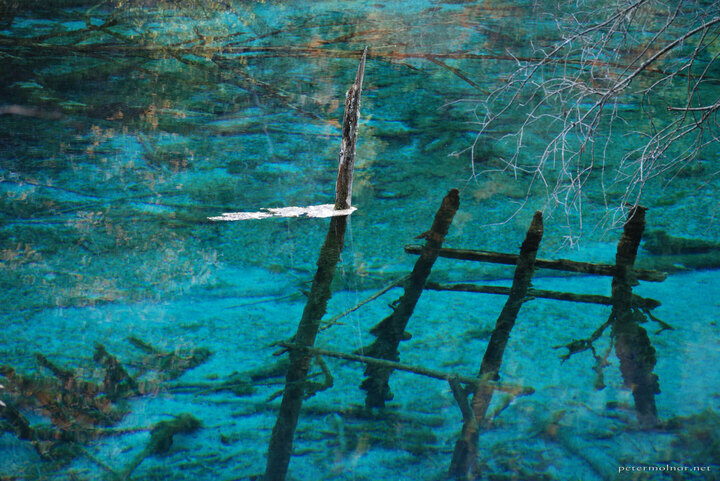 It has lots of dead trees in deep, rich green-blue water, which changes hue when you’re walking around it. Taken at the Multicoloured Lake of Jiuzhaigou Valley China, lake, Jiuzhaigou Valley (九寨沟), Sichuan, autumn; with all the reflections of the autumn colours, the blues of the water, the small tree on the tiny island on top of a dead, underwater tree it is a place where you could spend days, just wondering around. 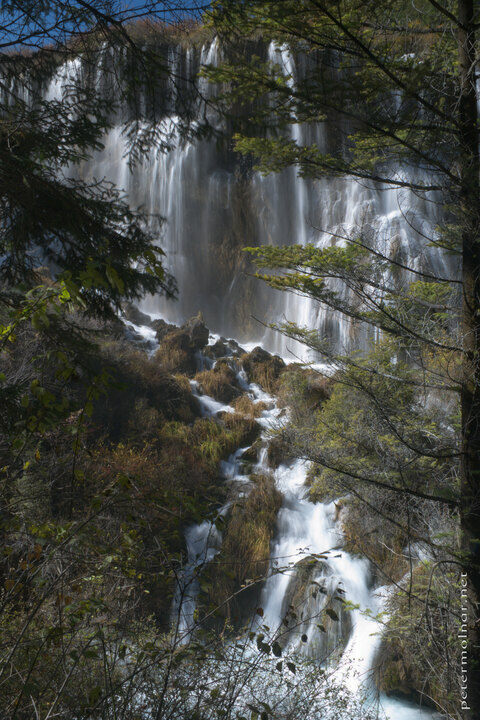 The Panda Waterfalls is the one falling from Panda Lake in Jiuzhaigou Valley (九寨沟). 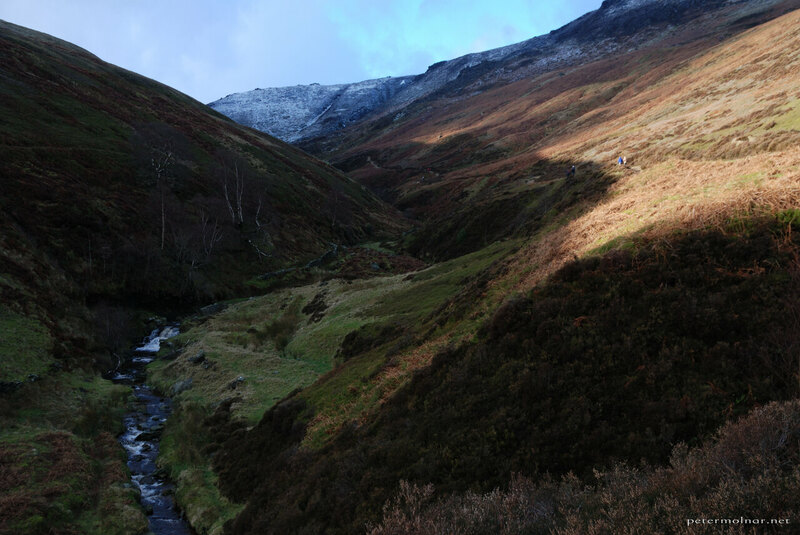 We had only one day in the park - where one could easily spend weeks - and we wanted to visit both valleys accessible. Unfortunately we were in a bit of a hurry by the we reached the Panda Lake since the last buses were about to leave and we would have been looking at a ~20km walk back to the entrance in case we miss them. If you plan to visit this place, plan at least 2 days for it, but even that is extremely brief. We had a very limited time at this point: it was getting late and we both started to feel dizzy due to the rapid changes in the altitude - the spot I’ve been standing at is at approximately 3000m. 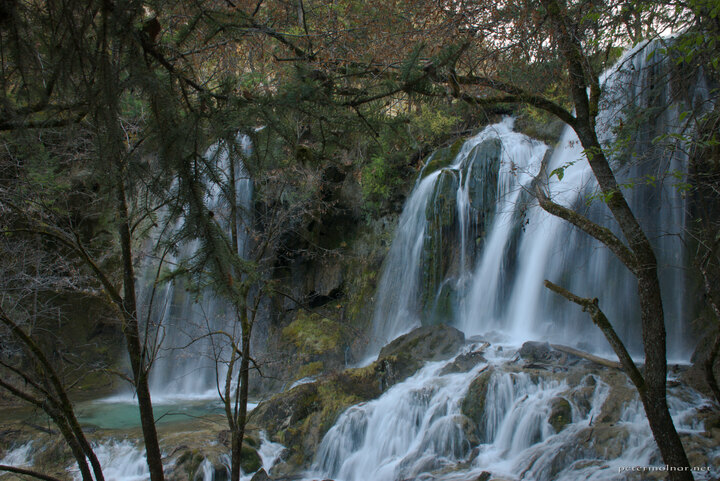 It was unfortunate to underestimate the size of Jiuzhaigou; without the buses, we could not have seem even one part of it, but this was, we were able to get a glimpse of both paths. The Five Coloured Pool in Jiuzhaigou Valley (九寨沟) is the biggest attraction. 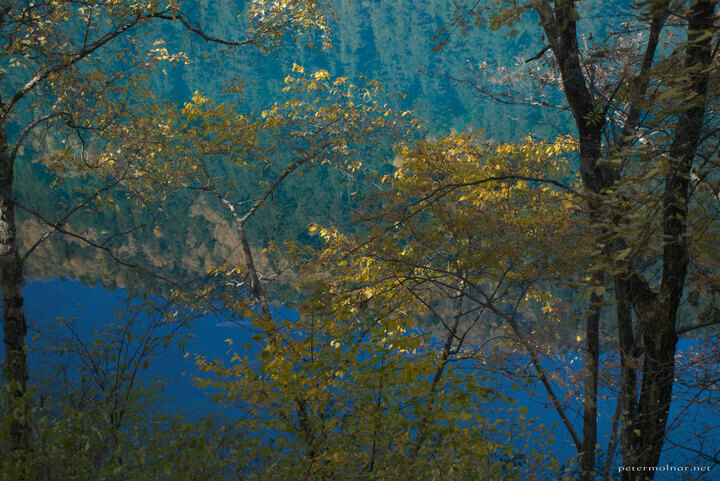 It’s a small lake with 5 different tones of rich blue, a blue which is very, very rare. The crowd is pretty bad around the lake, especially in the middle of the day, so brace yourselves before arriving. Part of the magnificent Nuorilang Waterfall in Jiuzhaigou Valley (九寨沟), Sichuan. The water drops from a lake, half covered with plants, so it seems like falling out from the field itself. ..It’s nearly impossible to avoid the crowd, but during autumn, at the end of October it’s not entirely hopeless; just be patient. 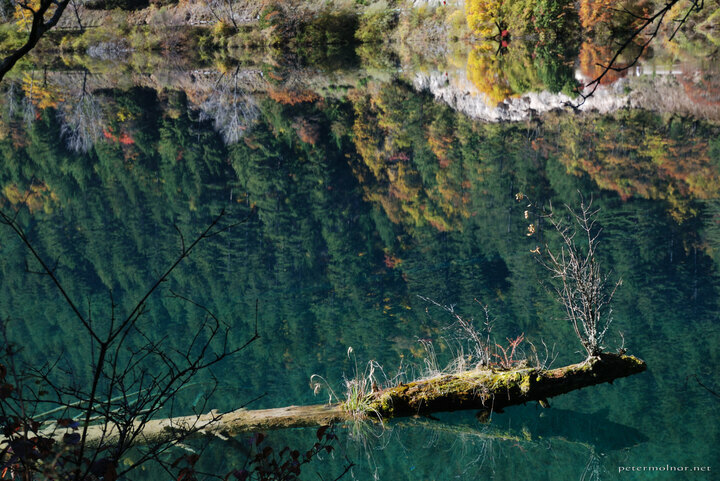 This is the view of Rhinoceros Lake in Jiuzhaigou Valley (九寨沟) when autumn arrives and all the trees changes into different, burning colours around it. 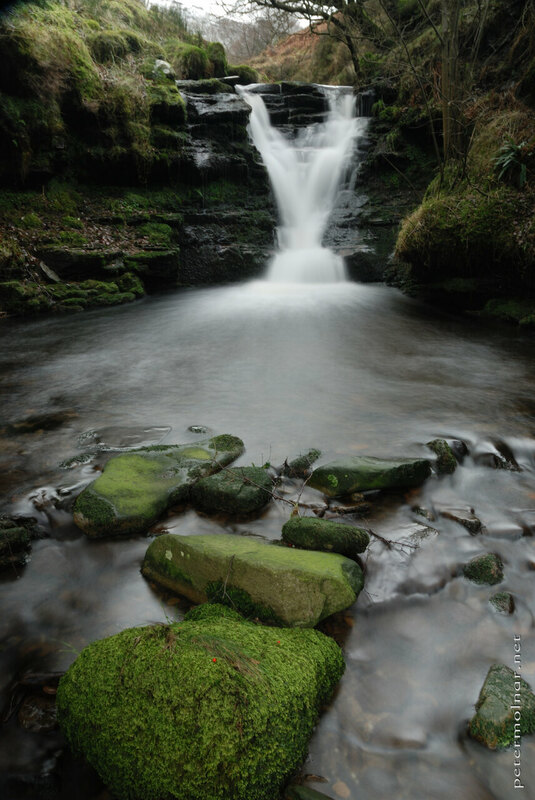 The footpath on the opposite side of the road is nearly empty; if you want to escape the crowds and have a little time with nature there, explore this area. 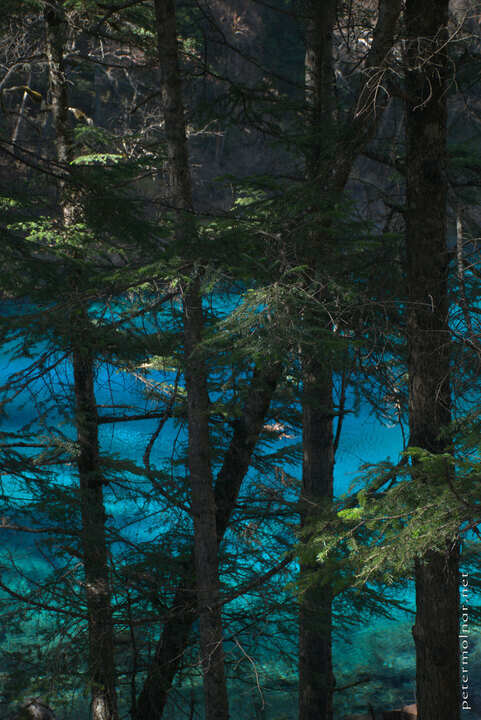 Rhinoceros Lake is just one of the lakes in Jiuzhaigou Valley (九寨沟), in Sichuan, China. 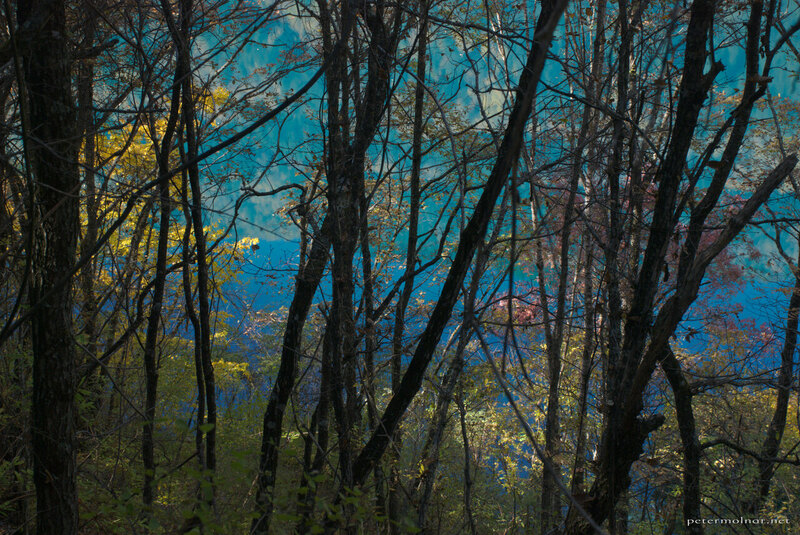 It has a deep, fascinating green-blue colour which reflects the autumn painted trees miraculously. The footpath on the opposite side of the road is nearly empty; if you want to escape the crowd and have a little time with nature there, explore this area. We spent a day in Jiuzhaigou Valley (九寨沟) in Sichuan, China. After the first shock of immense amount of tourists at the front gates the walk path beside the beautiful Rhinoceros lake turned out to be nearly empty. 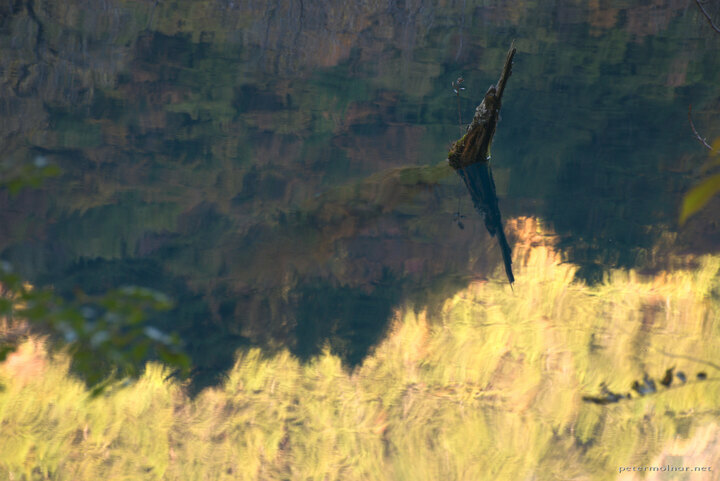 This reflection was photographed there. This is real. There is not a single piece faked on this view. 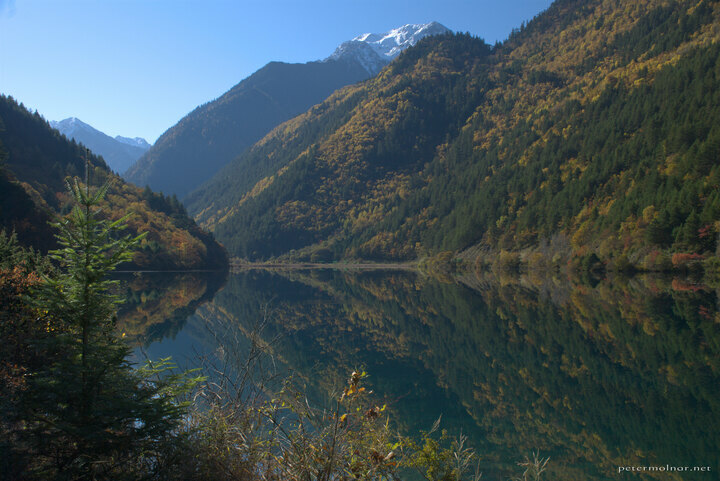 A view from the footpath on the left side of Rhinoceros Lake in Jiuzhaigou Valley (九寨沟). Nowadays you have to take the bus in the valley at the front gates. 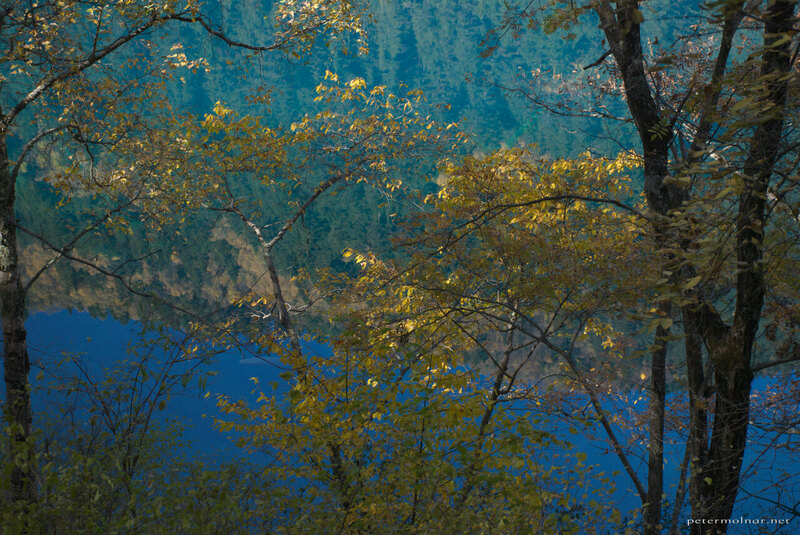 To find this view jump off at the first possible option and continue the walk on the opposite side of the lake. The weather was really nice to us on that day, and with the late October colours, it is a miraculous sight. 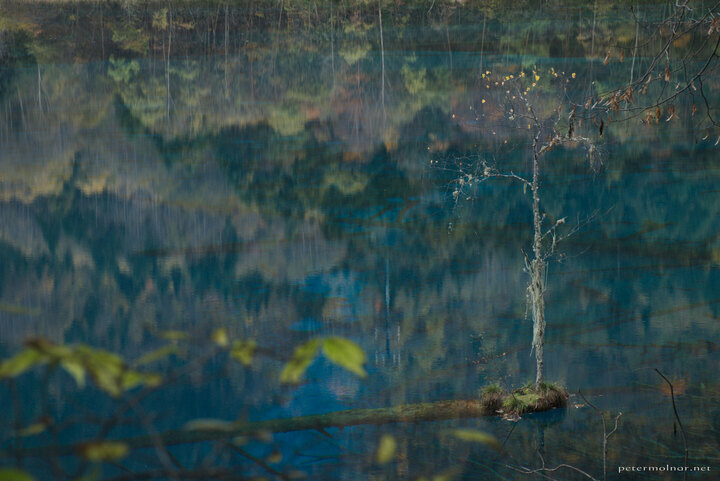 Taken ad Rhinoceros Lake, in Jiuzhaigou Valley (九寨沟) in Sichuan, China, At first, even in real life, it was hard to tell reflection from origin. 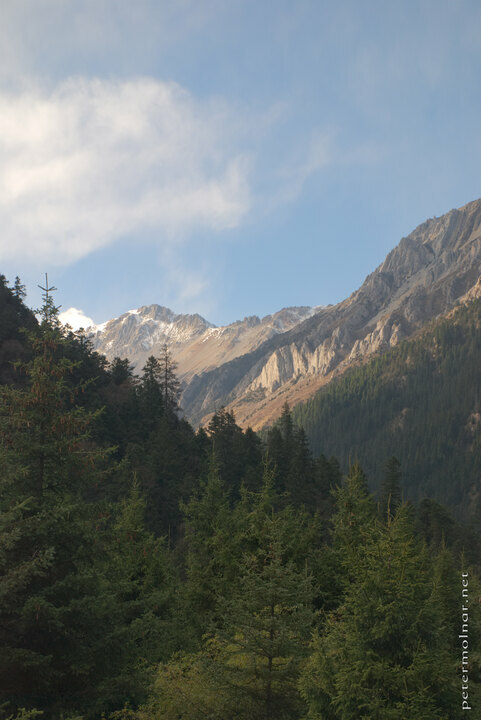 This is the view you get if you wake up early enough in the freezing cold and walk out from your unheated room in Zanghzha, the city made for tourists besides Jiuzhaigou valley. 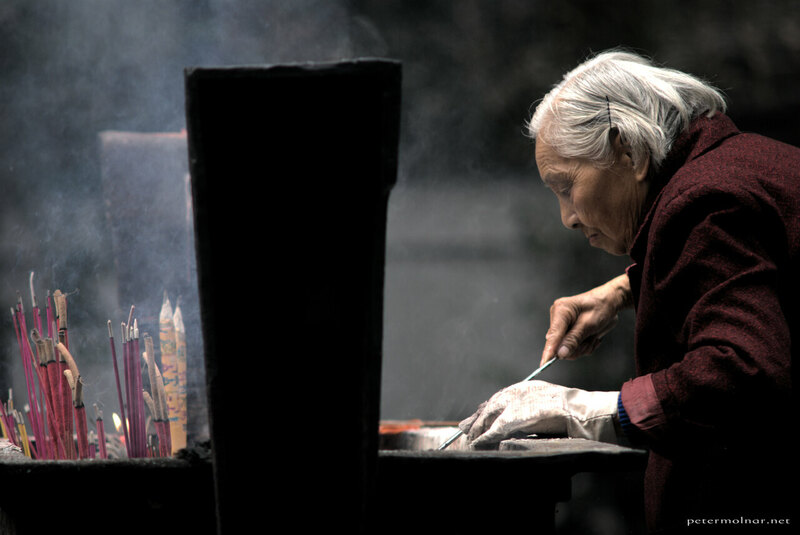 The Qingyang Taoist Temple in Chengdu (成都) is rather a small, ancient village than a temple, from the eyes of a European. This old lady was keeping the incense holder clean and tidy in front of a shrine. Mount Qingcheng (青城山) is a sacred mountain - and so a popular tourist attraction - close to Chengdu, in China. It’s not an easy climb, but all the Chinese girls were doing it in high heels - respect ladies. 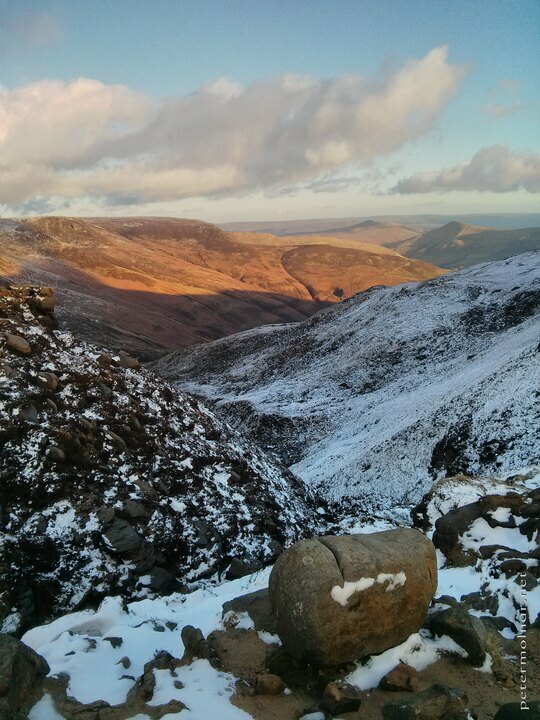 Be prepared for extreme fatigue in your thighs just before reaching the top, but it was worth the pain. 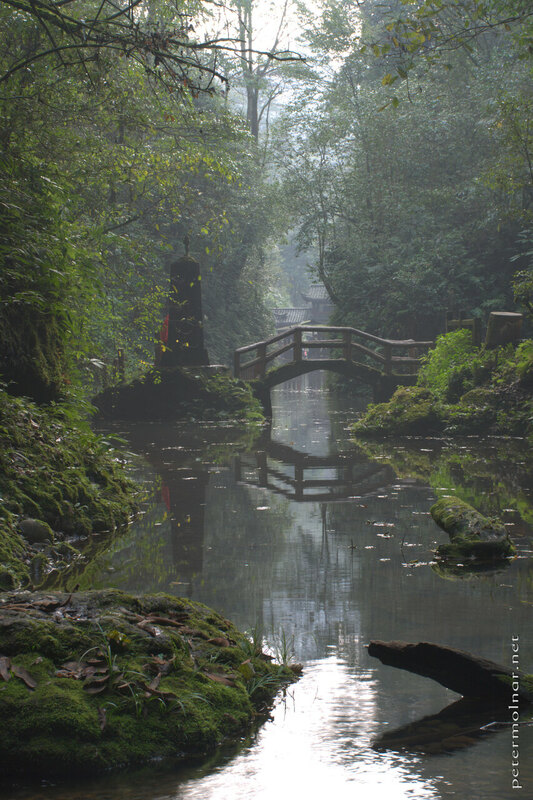 In case you climb the rear peak of Mount Qingcheng (青城山) there is a small lake in the way. The only option to cross it is to jump on the ferry which goes from one side to the other. Be careful to reach the last one: after it gets dark, the ferryman goes home and you have to sleep at the surprisingly frightening ancient town a few hundred meters higher. This is one of the rare images I took with an analogue machine. The original is colour, but I knew this was going to be a black and white one in the end. 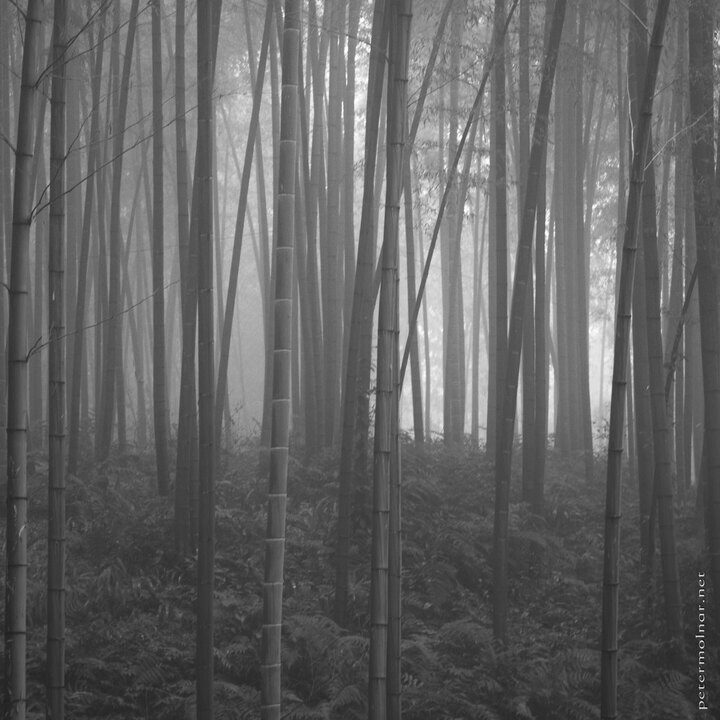 The scan of the negative was done in a common quick lab, the black & white conversion by Rawtherapee. It was taken not much later the freshly renovated Erzsébet tér was opened in Budapest. 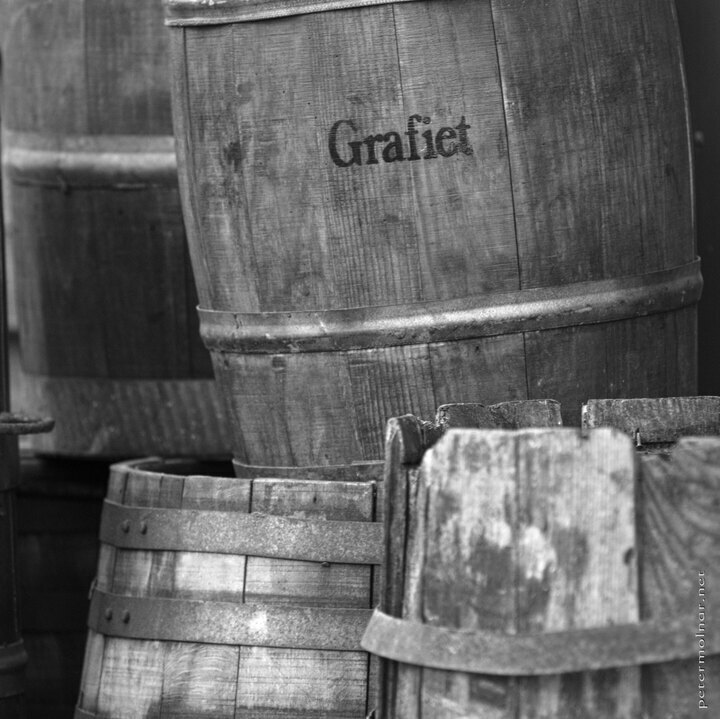 In Zandaam, The Netherlands, we’ve came across a few barrels right next to one of the windmills. We reached the Norfolk lavender fields just before sunset, which gave us nice gradient backgrounds. 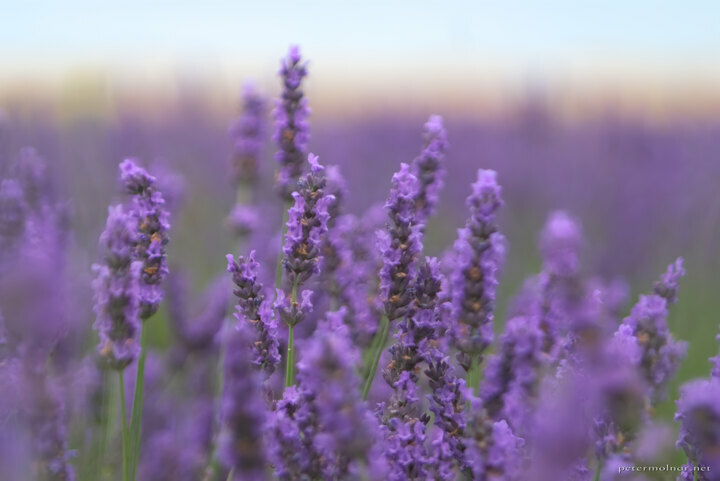 If you ever plan to visit the lavender fields, do it in July; that is the time when they are the most beautiful. Originally we wanted to take a photo of the waterfall in the background and only spotted the white skull when we reached it very close. We spotted the waterfall from the tourist path way above; the slope was surprisingly steep downhills, but the view was worth it. Blurry was trendy, so I made it blurry. And the wind of course was blowing too hard not to do so. 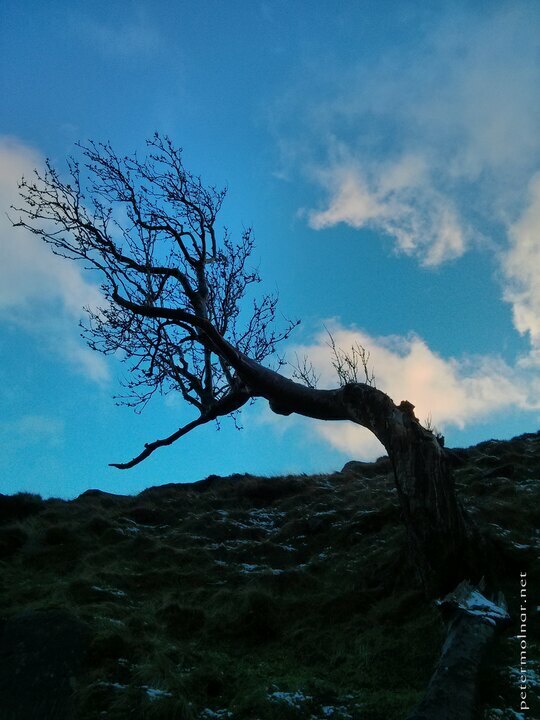 During our visit to the winter Peak District, I saw this tree - I’d rather say, this dryad, this wood nymph. No wonder there are that many legends and myths of woodland creatures. Lichen is common in a fir forest, but I rarely encounter this much covered cones. 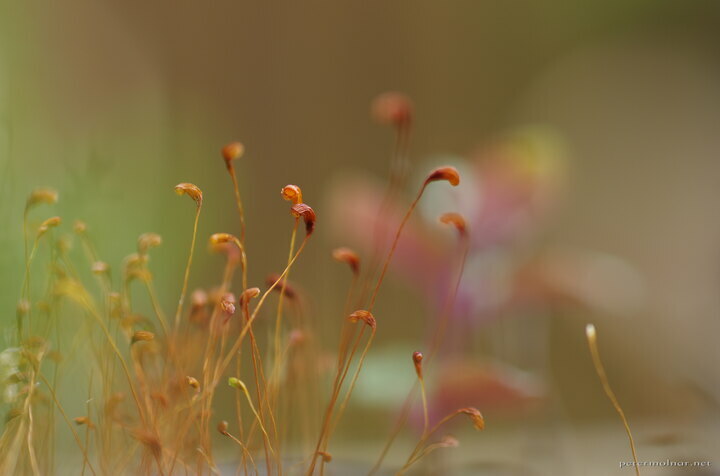 We had some moss growing in the same pot the red mint is living in, so I took a few shoots. The colourful spots in the background is the mint itself. 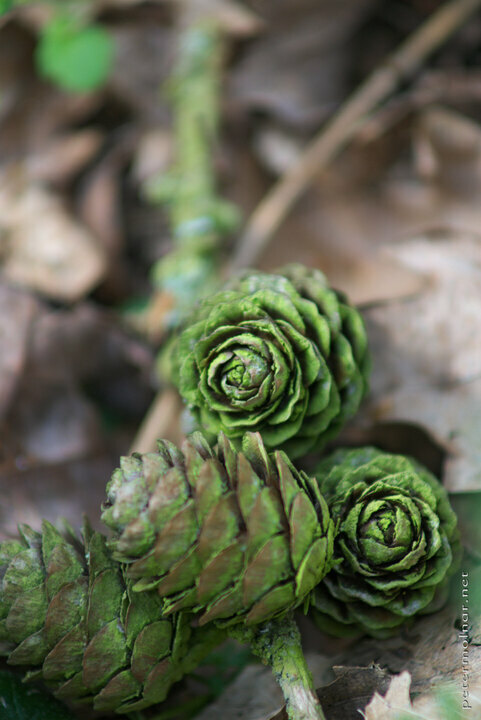 Shoot with an 50mm 1.8 + Raynox DCR 250. Norfolk tulips - You're all individuals! No, I'm not! 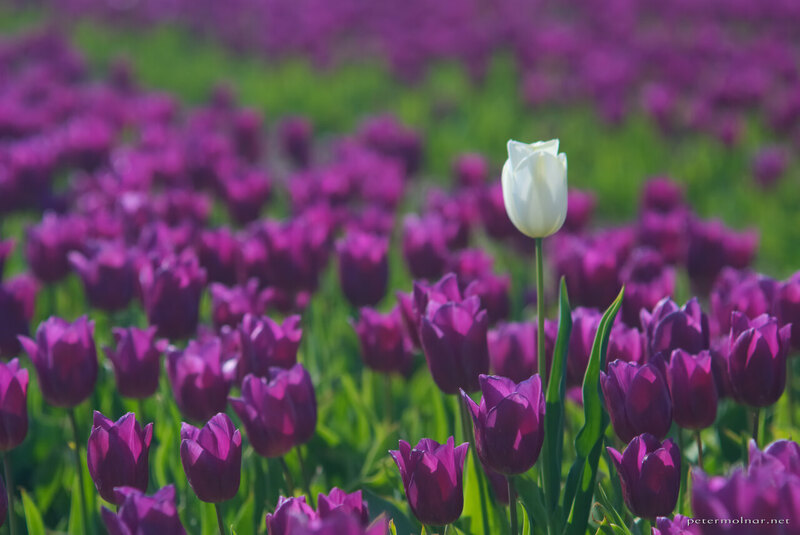 Norfolk tulips - You're all individuals! 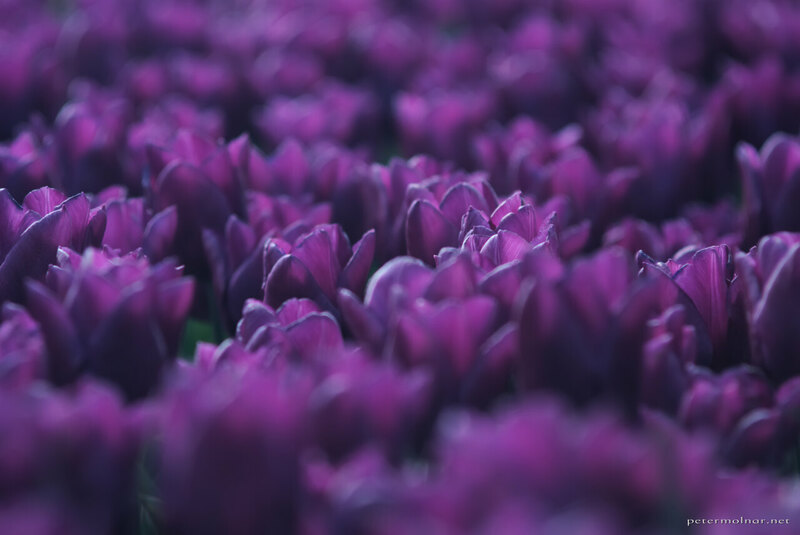 When we’d read about the tulip fields in Norfolk, we immediately wanted to visit them. Lucky with the time of the year, we managed to get there, although finding it is a bit tricky: you can spot them from the highway, but finding the road that actually gets you there is another story. It definitely worth it though, but prepare for a massive heat on the field itself. 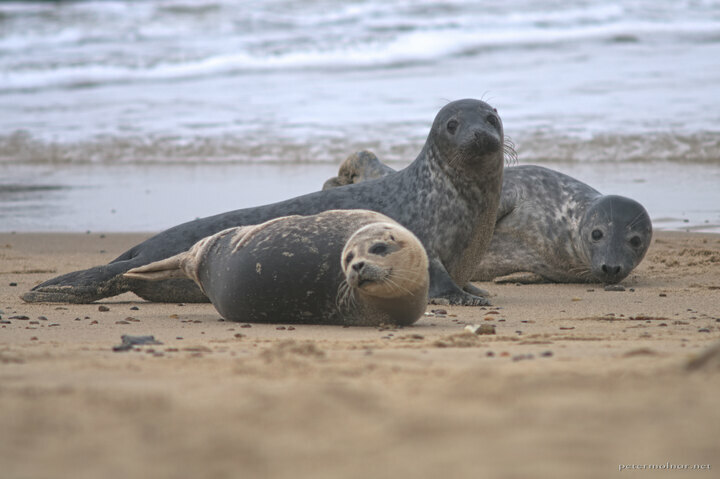 Beauty of Norfolk: when you can walk ~5 meters close to 3 baby seals and take a picture like a boss. There are some shores in Norfolk where you can literally walk right next to the seals, all year long. 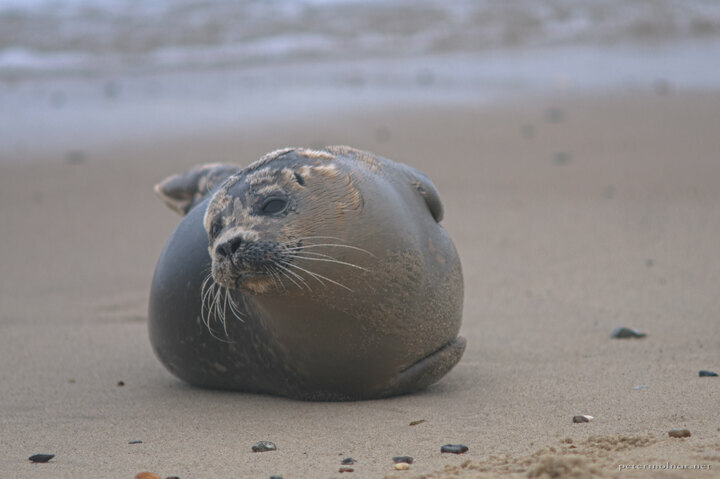 They are lovely creatures - as long as you keep your distance -, especially the fat little babies, just lying, sleeping, playing around. 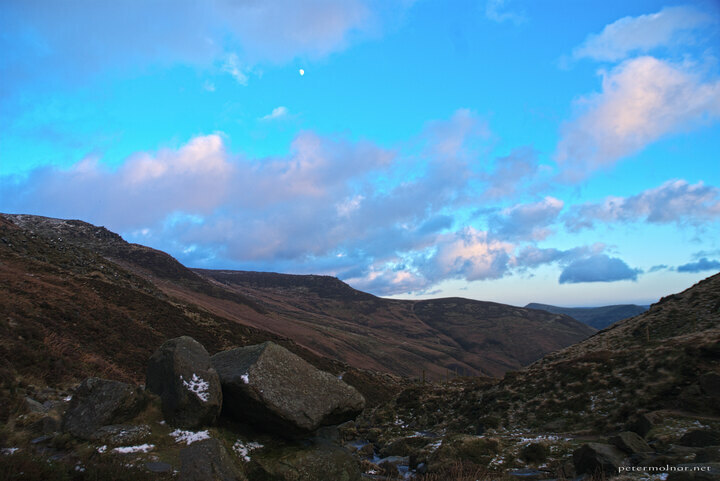 The Peak District is about what it’s name states: peaks. 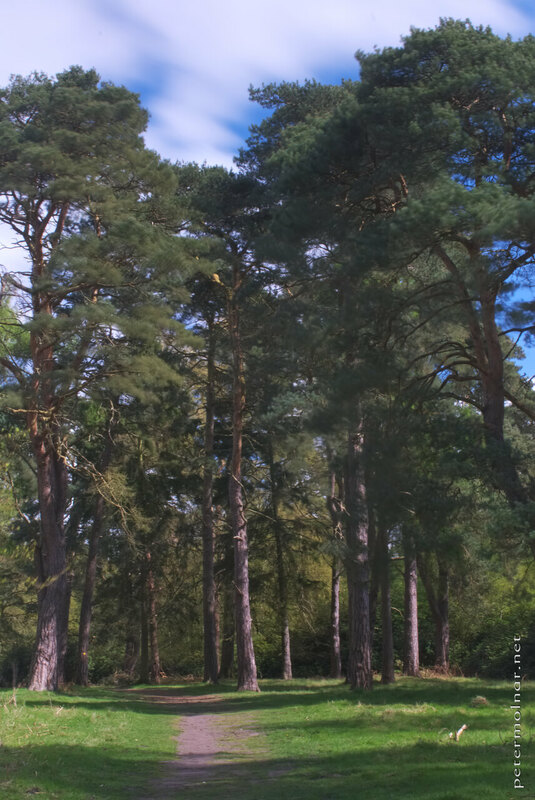 During the winter, it’s nearly abandoned, with only a few enthusiasts out there, it’s quiet, peaceful and beautiful. Watching the sunset from the top of a hill is always beautiful, until you realize, you’ll need to get down in the dark. But is was definitely worth it. 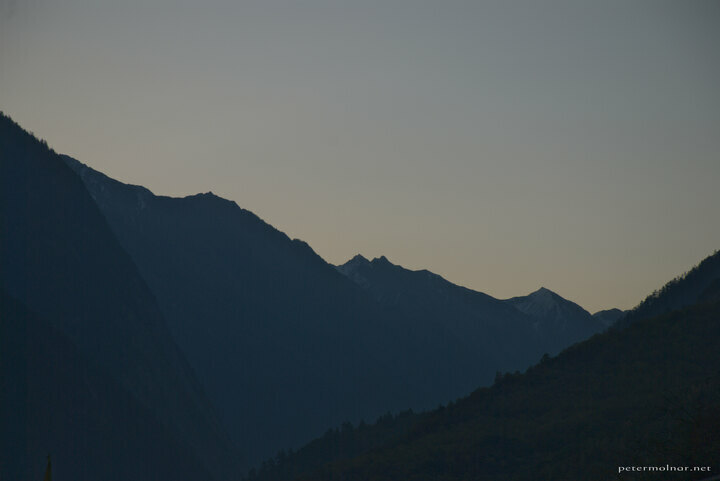 Still bright, blue sky above the peaks could even be called a common view - but not with the Moon shining bright already. We decided to have a special photo excursion with some friends by all of us bringing an analogue camera beside the digital ones. I brought a Contax RTS1 with Ilford Pan 1002 film; I was very pleased and quite surprised how exceptionally good this film is.